I’ve been slacking on collard green recipes lately and have had this recipe kicking around in my head for a while now. Today it expressed itself and they turned out really well. They’re sweet and spicy hot and would go great with some savory black beans. Sauté the onions, garlic and chili pepper in a drizzle of canola oil until the onions begin to soften. Add in the collard greens and currants and mix well. Allow to cook for 10-15 minutes. [If the collard greens weren’t still wet from having been rinsed, add in a splash of water to help steam them.] Once wilted, but still bright green, add in the marmalade, orange zest and grate in the nutmeg. Stir to combine and set aside off the heat. Once cooled, place on a cutting board and chop the filling so that no long strands of collards remain. Add the dry ingredients to a mixer and then add the wet. Mix slowly until the dry ingredients are damp and then turn up the mixer to a medium speed. Mix for 5 minutes. Spread a golfball-sized amount of dough over the middle area of a softened corn husk. 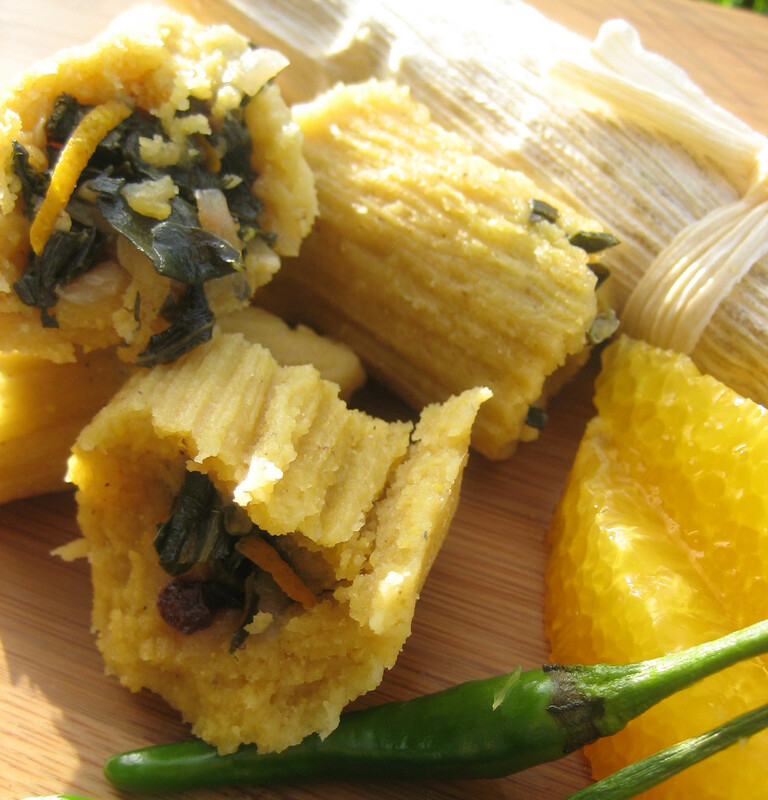 [ You can certainly make larger tamales that cover most of the husk area, I just prefer sweet tamales to be petite.] Place a tablespoon of the filling down the center in a line. Roll the cornhusk over while rolling the dough over the filling. Once rolled, use a strip from another corn husk to tie around the center and secure the tamale into shape. Steam vertically for 30 minutes. Serve fresh from the steamer.